Full-On Fit! : Starting the week off right! It's Monday... which tends to bring on the Monday-blues, where we spend time wishing that it was still the weekend and dreading the week ahead of us. However, I came across this quote today and I couldn't help but post it -- I am making it a goal for myself to be more positive about the beginning of each week and to allow myself to "lose/find myself"in the things I love to do ANY TIME during the week, not just on the weekends! 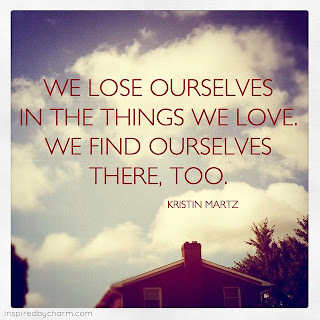 So here's my challenge to you -- what are YOU going to allow yourself to lose yourself in this week? So far I am loving my yoga classes so I am going to allow myself to go to a couple of classes this week that usually I don't allow myself to do because I "just have too much to do". Also, I love to cook and bake, so I may just allow myself to get lost in that as well! Happy Monday everyone!